Come, read, first rate interview of Marcus “Buchecha” Almeida. Buchecha talks about growing up, moving to America, personal student pet peeves and the possibility of fighting MMA. There are not many instances where bribery in any form denotes positivity. 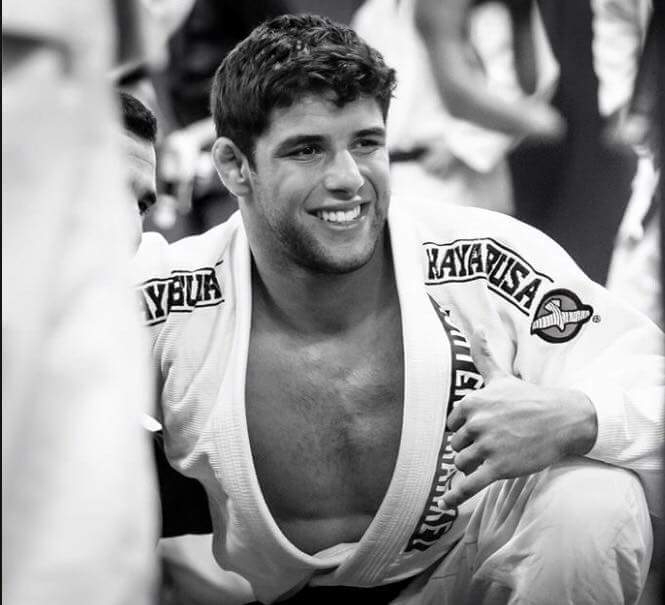 In the case of Marcus Almeida bribery is EXACTLY what led to his love of BJJ. Some say stay away from candy and chocolate cake (not good for training) but if it wasn’t for those guilty pleasures the BJJ World may have never come to know who Bucheca was. 12 years in BJJ, is it time for a switch to MMA? BJJLegends talks with Marcus Almeida about where he has been and where he is going. BJJL: Where did you grow up, any siblings? MA: Santos, Brazil. I have one sister three years older than me. She got me and my dad into Jiu-Jitsu but doesn’t do it now. She started, then my father, then me. BJJL: Did you have any other hobbies growing up? MA: As every kid I tried to be a soccer player. But it didn’t work out really well for me, so then I tried to surf, but not so good as well. Then went into Jiu-Jitsu I end up doing better at that. BJJL: Who inspired you while you were an up and coming practitioner, who was the biggest influence in helping you get to where you are? MA: I wasn’t like this size when I started like back in 2003, 2004. So I grew up watching Marcelo Garcia, Hunter Reyes, Saulo Ribeiro, Jacare, Leo Vieira. So this was the guys that I always looked for, always liked to watch and learn from them back in the day, watching videos and stuff, you know. BJJL: What was your first BJJ memory? MA: I remember like when I was like twelve years old, my father always tried to push me to do it. But back in the day when I was a kid I wasn’t just like, I wasn’t quite enough and serious, and he always like walked me, he used to give me like buy me a chocolate cake and like coke just to go there to train, you know? Every time when I went to train I knew he would give me like chocolate cake, candy, and stuff. So that’s one of the reasons why I used to go. And it worked, you know? I can’t complain. BJJL: Who or what is your support system here in the US? MA: The first time I came to the U.S.A. was 2010. I remember the guy who gave my support was Rodrigo Cavaca. He gave me the opportunity to come to teach but the guy who taught me everything in the U.S., and the way of life here was Rafael Shad. The U.S. lifestyle is very different from Brazil. BJJL: What is your biggest pet peeve as an instructor (students late for class, belt not tied properly….)? MA: If a student hasn’t been respecting the class. I’m OK, but if the guys are not listening, I show them positions, I teach them one move, the guys’ doing another move. It kind of bothers me a little but not that bad. BJJL: What do you consider a well-rounded practitioner to be? MA: I think if you want to be good you have to know like a little bit of everything. Even if you know your best game, if you don’t like the other stuff, you still have to train everything. That’s how you learn, that’s how you grow up, and that’s how you do it. You develop more technique so you have to train a little bit of everything otherwise you never learn. I’m not saying you have to do it tournaments, but at least you will know how. BJJL: When you see a student struggling, that is ready to quit, how do you help them adapt and overcome? MA: If they have their reason, if the student just doesn’t like to train, that is part of the game. You have to train. I’m not going to force them to do stuff that they don’t want to do. It’s better you get lost in the gym than to get lost in the tournament. It’s better to work through your problems in a gym, in your gym with your friends, with the instructor, than to be stuck and not know why over and over against your opponent in a tournament. BJJL: What rank was the most challenging for you? MA: It was no doubt the blue. Because it was at the beginning when I started competing and that’s where I learned how to compete. It was the hardest I knew, not a lot of winning, mostly losing and learning all that came with the blue belt. BJJL: Was there ever a time that you did not want to continue with your journey? MA: Oh yeah. I remember too, one time in blue belt I lost like the first ten tournaments that I competed in. I lost the very first round, so I remember one time I tried to give up. I remember the instructor told me, it’s up to you, you can be the weak one and give up or you can show up in the gym tomorrow again to train. So I thought to myself, I don’t want to be the weak one. I came back, and my eleventh tournament I won, after that just winning, winning, winning. My first World’s I lost in the final. After that I got better but still lost a bunch of tournaments. It was not easy, I worked very hard and wanted to give up many times. I did not win World’s for the first time until 2012. BJJL: Were you ever so upset over your loss that you threw your medal away after you placed 2nd or 3rd? MA: No. I think that’s ridiculous, you know? I think that’s ridiculous, that’s the most ridiculous thing that I have ever seen, people throwing away medals. You know? I’m really proud to have all the medals, I won them. I have a bronze medal, I have a silver medal and I have like six gold world medals. So I’m really proud. I went there and I got first place, I got second place, I deserve it. The other guy was better than me, so no reason to be like keyed up and throw the medal away. I think that’s like stupid. That’s so ridiculous. I think if you don’t know how to lose you don’t deserve to win. I think people who do that they’re going to learn the hardest way. You know, you’re in the final, you did your best, you lose, alright. There’s no reason for you to be there complaining, crying, if someone is better. It’s part of the game. Show up the next tournament better. That’s how it works. You don’t need to be throwing medals away, show respect. BJJL: How do you think BJJ has evolved since you received your black belt? MA: I think I changed a lot, because you start getting mature and you start getting more experience. It changes a lot, not just your body but your mind, your vision. As BJJ evolves, so do you, you think differently, you tailor your training. I think I have improved a lot. I remember the first year as a black belt was really bad because I lost a lot. Then adjusted the way that I train. The following year, 2012, the guys I could not hang with in 2011, I could in 2012. BJJL: You recently competed at Abu Dhabi and won, that is an experience of a life time, how do the rules at Abu Dhabi differ from IBJJF, CBJJE, or any of the other tournaments you have competed in? MA: It is something unique. You’re fighting two in two years, you never know if you’re going to be invited or if you’re going to win a prize. That makes the tournament very different. There are people from different types of sports and styles of fighting. So it’s really something amazing, I fought just one time in 2013 and won. The rules were different. You’re always fighting a different location, somewhere that you’ve probably never been before and I love it. BJJL: This year at World’s you gave it all you had against Keenan Cornelius, you could have conserved some of your energy but you went out there and put it all on the line, do you ever worry about running out of steam during your fights? Some like to play it safe and you did not do that at all. MA: That probably is because I was in control the whole fight. I was up in the whole fight. In the end he was trying to hold one position and I was having a hard time getting behind him. That’s the thing about fighting. I couldn’t stay there and win by two points, I was ahead, so now I tried to improve the score and tried to like get the guard. So was like something of a fighter, you know? I remember I was told me it’s not what you win, people are going to remember how you fight. I don’t want to be the kind of guy that just wins. I want to go there and give my best, not win due to one advantage or one point, not go there and hold one position for ten minutes, that’s not me. I want to go there and give people Jiu-Jitsu to watch. BJJL: What’s your training regimen like? How does it differ day to day from when you’re getting ready for a tournament? MA: I always train twice a day. No matter what, if I’m training or not. In the morning I always train really hard with the pro training, all the black belts, and one day on and off I train Jiu-Jitsu twice and the other days are different just for conditioning. It’s Jiu-Jitsu, Jiu-Jitsu, and the other day, Jiu-Jitsu conditioning. I don’t train more than two, two sessions per day. BJJL: Are there any female practitioners that you have enjoyed watching grow and evolve over the years? MA: Oh yeah, there’s like a bunch of fighters I like to watch. Michelle Nicolini, McKenzie Dern. I used to watch Leticia Ribeiro a lot. I like Bia Mesquita. There are a lot of women I enjoy watching compete. BJJL: If there is one thing (across the board) that you would like to be standardized when it comes to BJJ rules, what would it be? MA: I think a lot of things. They stop the fights when you are right in the middle of fighting it breaks the momentum. They can change the rules in the middle of the fight. People just want to fight. BJJL: You are in your prime, have you considered trying MMA and starting a career as an MMA fighter? MA: Yeah, yeah. In one or two years I’m doing it. BJJL: As a young practitioner were you always the biggest in the class? MA: No. I was an average boy. BJJL: Once you reached the heavy weight class did you have a sufficient amount of training partners your size? MA: Yeah, I always had guys of my size. BJJL: Who are some of your favorite ultra-heavyweight fighters to train with or fight? MA: The guys I train with every day. They are my favorites. They are the ones that helped me to get where I am, you know. The guys from Check Mat California especially. They are my favorites. BJJL: How do you handicap your game in training for smaller training partners? MA: I use my technique and not my strength. BJJL: Is there anything you would like to pass on to a person that is starting out in BJJ? Some sound advice you wish you had known that would have prevented injury, aggravation, etc? MA: If you take the time, you learn how to stand, how to like use strength the right way, you will learn how to like play the game. It is the best way to stop getting hurt. Injuries happen in the beginning, it’s normal. Once you start learning how things work, it’s going to be more fun and you’re going to enjoy things more. BJJL: What has been your proudest moment since you began the practice of BJJ? MA: Oh, when I won my division, the open division of worlds and Abu Dhabi. All three titles. That was the proudest. BJJL: What are your plans for the future? What goals do you still have left? MA: I just keep training hard and whatever happens, whatever comes my way I look forward to it. I don’t think too much about it. MA: I would like to thank ALL my sponsors. Also Mark and Muscle Pharm, Fighter’s Market, Hayabusa, Jiu Jitsu World League, of course my Team CheckMat and everybody who helped me a lot during my journey. It’s not always about when you start or how often you win in BJJ it seems to be ALL about the journey, each one unique, no two will ever be alike. Some say you get what you give but if that were true then practitioners like Buchacha would be the rule instead of the exception. Sometimes what you give won’t be enough. Not everyone can be exceptional in spite of their efforts because the odds are against this however, the day that Marcus Almeida set out to be GREAT, EXCEPTIONAL, A REALITER MAGNUS PACISCOR (a really big deal) the odds were in his favor. Marcus Almeida was lured into a gym with the promise of some edible delicatables at the end of the session. The cake may have gotten him in the door but the Art of Jiu-Jitsu kept him there. 12 years later his journey has truly been a realiter magnus pacisor. Daily Rickson Interview Series 10 of 24: How has Jiu-Jitsu changed you?